I'm sure whichever corner you turn to, you'll sure to be hearing something about the World Cup. And if you aren't at least following the results of matches, you SHOULD watch the FINALS of the World Cup! The Match will be played on a Monday morning (2.30am) at July 12, 2010. The only question is.......where to watch? If you still do not have the slightest inkling on where to catch the game, let me give you a hint on where the grandest and hottest party in Malaysia for the world cup will be (next to being in South Africa watching the game live at the stadium). 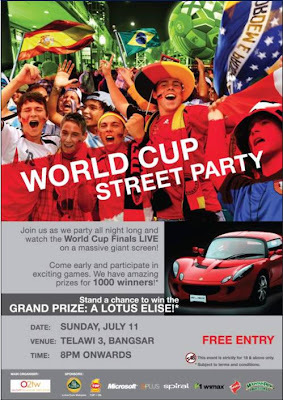 The World Cup Street Party held at Bangsar Telawi 3 organized by Out of This World!!! It'll be of course held on the night before the match starts, July 11, 2010. Doors will open at 8pm. What's cool about this party aside from free entry is the amazingly, insane cool prizes you stand to win. And what are they? iPod Touch, Digital Cameras, PSP, Mobile Phones, Soccer Jerseys, MP3 Players, WIMAX-Inside 4G Laptops just to name a few. There are 1000 prizes up for grabs and to top it all off, the Grand Prize is a Lotus Elise. Yes, you read it right, a Lotus Elise sponsored by Lotus! Along with prizes giveaway, there'll be performances by deejays, singers, dancers and so on. As for the World Cup, there will be a gigantic, humongous, massive giant screen to watch the finals. So look no further as this is the place to be for the World Cup finals. To top it all off, print out the flyer below to redeem a FREE drink voucher at P1's booth (while stocks lasts). PS: This event is only for people who are age 18 and above. a Lotus Elise for win!